The Power of the Written Word In Creating a Legacy in Honor of "Our Fathers Who Art In Heaven"
Last night at a business function, I learned that a friend's son got to know my Father, who died before his son was born...an impossibility? ...a visit from the other side? Neither. My friend shared an original copy of the sneak preview of "Our Fathers Who Art In Heaven" with his son on Father's Day weekend. He wanted his son to learn the importance of one of my late Father's life lessons, "leave things better than you find them". Dad, I never realized the importance of sharing your story and life lessons with strangers by writing your story in "Our Fathers Who Art In Heaven". Your energy will live on in the hearts and minds of generations to come. Thanks Dad for being my best teacher. Now you are teaching another generation...you never met. What Are Your Thoughts Now That Mothers Day and Fathers Day Are Gone? So many of our memories and actions are holiday driven. When Mothers Day and Fathers Day are over, minds quickly switch to the 4th of July and summer vacation. What are your thoughts now that Mothers Day and Fathers Day and are gone? Happy Fathers Day and an Update On Our 2nd Annual Fathers Day Celebration and "Kids Drawing Dad - 2006"
We started "Kids Drawing Dad" last year as part of an Our Fathers Who Art In Heaven" book signing. The drawings for both years can be viewed by clicking on the drawings of Dad found in the left hand column of the "Our Fathers Who Art In Heaven" Blog. It is such a joy to see families participate in Kids Drawing Dad. We would like to thank everyone who created a drawing. We would also like to express our great appreciation to the University at Buffalo students from UB's Pi Sigma Epsilon who helped to scan the drawings (and patiently troubleshoot our scanner problems). A special thank you also goes to the Walden Galleria Mall and the local Pyramid Management Group for hosting this year's 2nd Annual Father Day Celebration. This year we donated $10 from each book sold to Buffalo Habitat for Humanity. Thank you to everyone who supported Buffalo Habitat for Humanity today. "The Faith of My Father" by Sharon Tabor Warren. Found in Chapter 5 - Compassion from the book "Our Fathers Who Art In Heaven" by Gerry Murak. Which are Your Three Most Important Words for Father's Day? "Thank You Dad" or "I Forgive You" or "I Love You"? My Dad passed away suddenly in 1984. Going to the cemetery for Father's Day has never been my idea of remembering my Father, who art in heaven. That is why the "Our Fathers Who Art In Heaven Foundation" was started. That is why I decided to share my Father's story and life lessons in my speeches. That is why I decided to write and share his story in "Our Fathers Who Art In Heaven". Everyone should have someplace meaningful to go on Father's Day and Mother's Day. After all, everyone has a Father and Mother, living or deceased - friend or foe. If they are deceased or a foe, they are still the origin of our own life. But if our Father or Mother is no longer alive where do we take our thoughts on Fathers Day or Mothers Day? I have heard that the odds of being born with our DNA are 224,000,000,000,000 to 1!! All human beings who ever walked this planet, are all part of a very special club - the "224 Trillion to One Club". With this unbelievable gift of life, we also have the wonderful gift of freedom to decide what we think. In all countries we may not be able to do what we want, but we can think about what we choose to think about. And regardless if our parents are or were friend or foe, we have the ability to learn from the time they shared with us, no matter how short or difficult a time that may have been. We have a choice to turn around our memories into positive thoughts and actions. We can take those life lessons, good or bad, and use them as an opportunity to create a legacy for future generations. If every human being would take what they have learned in life and, as my Father taught me, "leave things better than we found them" - then we could build an even greater world for future generations. My Father and I were not always the best of freinds but my Father's Day will never be the same. Thanks Dad! I love you and I miss you. Happy Fathers Day! "Peace for Pickles" by B. J. Taylor. Story found in Chapter 5 - Compassion in the book "Our Fathers Who Art In Heaven" by Gerry Murak. If your Father has passed, you can help their energy to live on in the hearts and minds of others by sharing their story and life lessons you learned with others this Fathers Day weekend. You are welcome to share their story on this Blog - "Our Fathers Who Art In Heaven". "Mess Sergeant Muzzy, U.S.M.C." - by Thomas Edward. 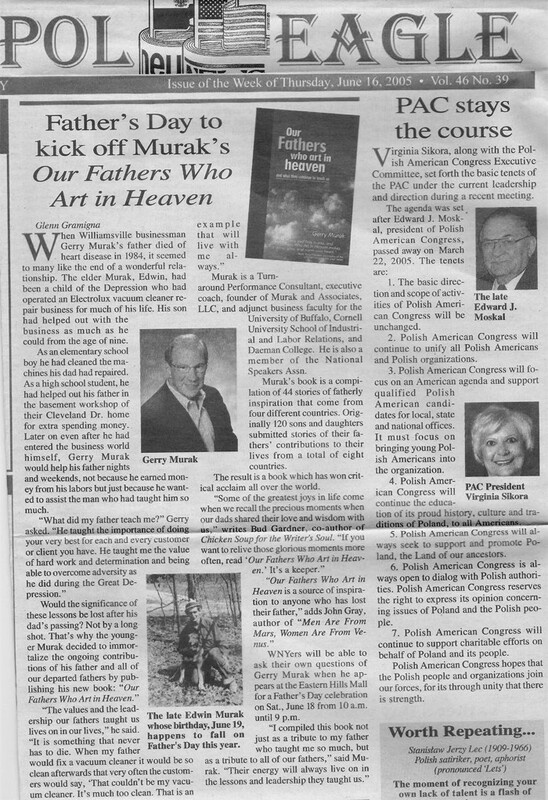 Story found in Chapter 5 - "Compassion" in the book "Our Fathers Who Art In Heaven" by Gerry Murak. 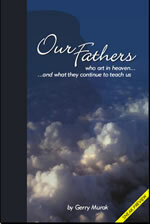 Ranked in the Top Ten of Fathers Day Books - "Our Fathers Who Art In Heaven"
The "Our Fathers Who Art In Heaven" was listed today in the top 10 out of 11,000,000 possible results on "Fathers Day Book"! !